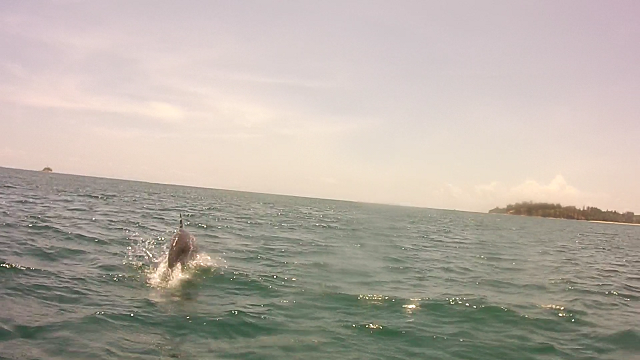 TRACC Borneo Volunteers: WE SAW DOLPHINS NEAR THE TIP OF BORNEO!!! It was quiet during our return trip from Light House. The weather was hot, but the sea was wavy and the water was cold. Everyone was tired after the harsh condition of the routine work dive. Max was our boatman that day. Even this humorous guy was not as chatty as he usually was. I was astonished. “Really!? Dolphin? Where? ?” Everybody in the boat was stirred upon hearing the word DOLPHIN. “Right----over there,” Max replied with his usual comical manner, “slightly to your left.” We brought ourselves to the side of the boat and gazed towards the direction Max pointed at. Someone fetched the camera and started videoing. One…two…swoosh! 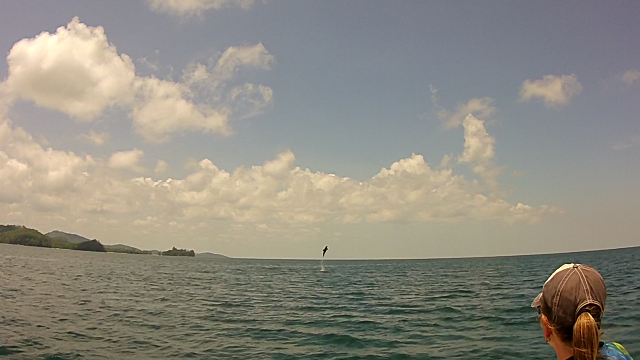 It was within seconds when another dolphin jumped out, right in front of our eyes. “A dolphin!” “DolphinSS!” There was more than just one. “Woohoo!” “Did you get it on the camera! ?” We were all excited. “Quick! Quick! Snorkel!! Fins!! !” “Jump jump jump jump!” We frantically put on our equipment and jumped off the boat, hoping to get closer and swim alongside the dolphins. But no, of course it didn’t happen, we scared them away instead XD. We climbed back into the boat and Max brought the boat towards the school of dolphins. We were literally chasing after them. The dolphins seemed to realize our approach and jumped out of the sea a couple of times. I fancy they were greeting us in dolphin’s custom, haha. We followed the dolphins for some time, and managed to get close enough to tape some videos to show our friends before heading back to camp. It was totally awesome. Now I have another thing to brag to my friends about my stay with TRACC.